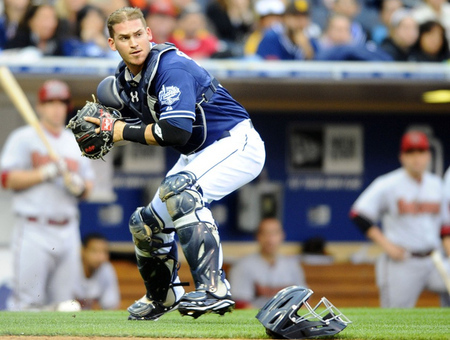 The San Diego Padres promoted catching prospect Yasmani Grandal to the majors this past weekend. A former college star at the University of Miami, it took Grandal less than two years to reach the Show. Grandal was born in Havana, Cuba, but immigrated to the United States at age 11 and became a citizen when he was in high school. A top prospect for the 2007 draft, he fell to the 27th round due to his bonus demands and strong college commitment. He took over as the semi-regular catcher for the University of Miami Hurricanes as a freshman in 2008, hitting .234/.358/.452 and showing good defensive skills. He improved as a full time starter as a sophomore in '09, hitting .299/.414/.599, then made huge strides as a junior in '10, batting .401/.528/.721 with 15 homers, 57 walks, and 35 strikeouts in 222 at-bats. This solidified his status as the best catching prospect in the draft. The Reds drafted him 12th-overall, signing him to a $3,200,000 bonus. He opened 2011 with Bakersfield in the California League, hitting .296/.410/.510 with 10 homers and 41 walks in 206 at-bats, 56 games. Promoted to Double-A Carolina, he remained hot with a .301/.360/.474 mark in 45 games. A late four-game trial in Triple-A resulted in a 6-for-12 (.500) line with five walks and two doubles. The Reds committed themselves to Devin Mesoraco as their Catcher of the Future, making Grandal (somewhat) expendable. He was traded to the Padres this past winter as part of the package for Mat Latos. He was off to a good start for Triple-A Tucson, hitting .317/.418/.500 with 21 walks and 27 strikeouts in 120 at-bats before his promotion. Overall, in 147 career minor league games, Grandal has hit .307/.405/.490 with 42 doubles, 18 homers, 84 walks, and 128 strikeouts in 619 plate appearances. Grandal is a 6-2, 210 pound switch-hitter, born November 8, 1988. He's a very solid hitter, with good power and excellent strike zone judgment. He isn't likely to hit .300 at the major league level, but he should produce above-average numbers in the power and OBP departments. He's had few problems with professional pitching, maintaining his production at each level. His bat speed isn't superb, but his refined approach to hitting helps him adjust. Owner of a solid defensive reputation in college, he had a few problems last year, giving up 19 passed balls and committing 13 errors in 90 games behind the plate. He has more than enough mobility and has strong leadership skills, and his reliability should improve with more experience. His arm is average but his release can be a little slow; he caught 34% of runners last year and 24% so far in 2012. Although not a spectacular defender at this point, he will certainly stick at catcher and basically just needs more experience ironing out his receiving. Overall, Grandal is a very impressive prospect, projecting as a regular major league catcher with power, strong OBP skills, and solid defense.